Today's disc dog freestyle team demonstrates a combination of Frisbee disc skills, dog training and Teamwork. 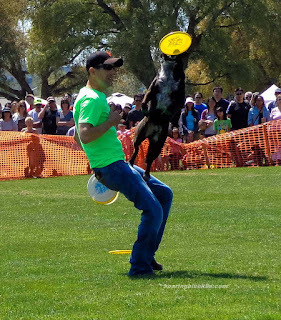 When fans watch disc dog stunt shows, most people marvel at the tricks the dogs are doing and don't notice the skills needed to deliver a disc to the place that the dog needs it to be to make some great moves. Today's article talks about breaking down what looks like an impossible set of deliveries to learn and being consistent in the delivery of your throws during competitive routines or play time. When you watch or are learning to construct your own freestyle routine, there's something not a lot of folks necessarily think about. There's the obvious part about the routine and that's training your dog to do specific tricks or stunts. There's also the training of team play, teaching your dog when to expect specific moves or designing your freestyle routine. But the more subtle aspect of flying disc dog freestyle training are the skills you pick up in handling the disc! The reason it is important to develop disc handling skills is that in order for you to have a safe freestyle routine, you need to be consistent in how you deliver the disc tosses so your pup does not hurt themselves trying to overextend to snag a disc that's been tossed inconsistently. The safety concerns are about your pup stretching too hard or far to catch the disc off his jump line. If they bound off your back towards your 3 o'clock, but you levitate the disc at your 2 or 1 o'clock position, your dog will either try very hard to snag the disc, taking themselves off the their catapult line, creating a potentially bad landing scenario. Other safety issues include tossing the disc so high that your dog extends too far up and back while flying forward, or inadvertently jump much higher than they should, creating another potential bad landing scenario. As you can see, a pup can get so focused on a poorly timed disc throw that they can end up hurting themselves. If you're not consistent to some degree in your disc deliveries, you endanger your dog plus, if you're inconsistent enough, your dog may begin to not trust you during routines. Sometimes they shut down. Yes, a part of the process of learning disc is teaching your dog to trust your consistency. Consistency is a huge key to a successful freestyle team. And becoming good at delivering your discs is a part of that equation. 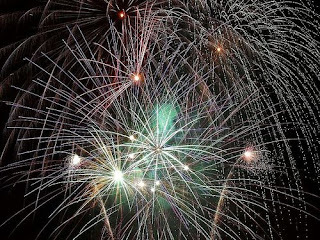 We're not looking for perfection, but close proximity to the same delivery for specific shows definitely helps. 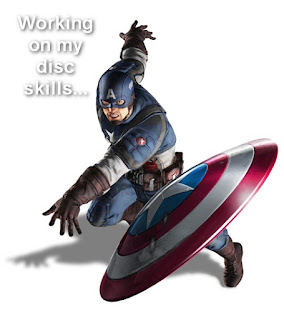 Brace yourselves for this crazy sounding thought, but as you develop your skills in disc delivery, you can technically create upwards of 200+ different releases. Yes, I said that. And if you figure these deliveries out with your dominant hand, switch hands, and you instantly have TEN releases in your arsenal. See, it's not as crazy sounding as you think when we talk about how many releases a player has. I'll say more on the different kinds of releases in a different and crazier post, but for now, we have to understand how important it is to be consistent for your dog. 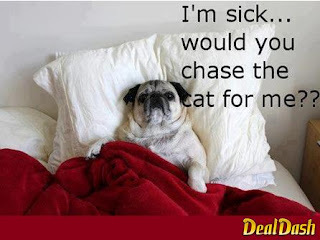 Without a consistent delivery you endanger your pup's health. It scares me to see folks make bad deliveries or dogs slipping off their human's back before they can get appropriate traction. It's all about the safety of the pup, right?